Armchair Fiction presents extra large editions of classic science fiction double novels. “Craig’s Book” is the first novel. It was an eerie mansion of mystery. Inside millionaire Hamilton Craig’s mansion there were some mysterious things going on. Six beautiful girls had literally vanished into thin air inside his private office—only to reappear several days later. But where had they been? What were those strange little cards that Archie Burnette always carried around? Who was the mansion’s mad scientist and what strange, fantastic experiments was he working on? Lastly, why did Hamilton Craig himself seem to have developed an obvious split personality? Author Don Wilcox had one of the wildest imaginations of any sci-fi writer of his era. 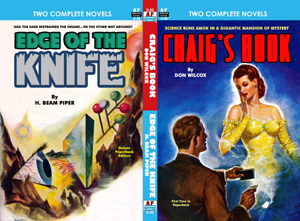 This thoroughly enjoyable romp is another reason why he earned the nickname, “The Mad Man, Don Wilcox.” The second novel, “Edge of the Knife” was thought to be too intense for the average reader. This short novel caused a bit of a flap when it was first published in Amazing Stories back in 1957. It was initially rejected by two other well-known science-fiction magazines, and both times for similar reasons: “this story is simply too hot to handle” and "too dangerous for our book." However, the then editor of Amazing, Paul W. Fairman, was brave enough to accept and publish it. Fairman also queried Amazing’s readers, wanting to know if they thought the tale was appropriate or not. All these years later this fine short novel still stands tall as a taut science fiction thriller and one of veteran author Henry Beam Piper’s very best efforts.